Institute of Engineering (IOE) initiated (Post Graduate) Master Programs in constituent engineering colleges from 1996. Urban Planning, Structural Engineering, Environmental Engineering and Water Resources Engineering were introduced in Central Campus, Pulchowk which later started M. Sc. courses in Renewable Energy Engineering, Geo-technical Engineering, Information and Communication and Power System Engineering effective from December, 2001. Norwegian Government, has started M.Sc. Courses in Sustainable Water Sanitation and Health Development from 2007 and Technology and Innovation Management from 2010. This campus has also started master program in Transportation Engineering and Disaster Risk Management from the academic year 2011/12. IOE has also started regular Ph D admission from academic session 2010/11 in all departments. A new Master’s program in Earthquake Engineering was started at Thapathali Engineering Campus in 2071 BS. RESULT OF IOE MSc. 2017/2073 IS OUT !!! Applicants willing to appear in the entrance examination to be held by IOE for the enrollment into MSc levels of its constituent campuses are notified to fill the online application form through the entrance exam website. The date and time for entrance exam 2017/2073 is mentioned below. The syllabus for Masters Degree entrance of IOE can be accessed from IOE M.Sc. Entrance Syllabus page. There will be 10% negative marking for wrong answer. It takes 1 or 2 days for publication of result from the day of entrance exam. The result of entrance exam 2017/2073 will be published by 25th of Falgun, 2073 (By 8th March, 2017). Admission Notice for the successful candidates shall be published by the Admission Committees of Constituent Campuses of IOE. The Academic session starts from 17th Baisakh 2074 (30th April, 2017). To be eligible for master’s entrance application, the candidate must have passed bachelor degree in relevant subjects with at least second division. 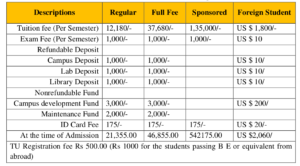 Applicant should deposit an amount of Rs 2,000 as an application fee for entrance examination in Account No. 00915056064 of the Siddhartha Bank Limited by submitting a specially prepared voucher often by filling applicant’s name and date of birth in it. The voucher No. indicated in the voucher needs to be specified in the online application form. and one of the following identification documents. Admit card can be downloaded on 17 th of Falgun 2073 (28 th February, 2017) onwards from the website: http://entrance.ioe.edu.np. The color printed admit card along with original ID document should be with the applicant at the time of exam. Planning and Architecture (PA), Civil and Agriculture Engineering (CA), Electrical Engineering (EE), Electronics and Computer Engineering (EC), Mechanical and Industrial Engineering (MI), Applied Science (AS) and Disaster and Planning (DP). The candidates under sponsored category have to pay the fee for full course duration (two years) at the time of admission. Also payment of fees by the candidate under sponsored category shall be received only by cheque of the sponsoring agency. The cash transaction shall not be entertained. 25% deduction from tuition fees prior to the start of class. 50% deduction from tuition fees till 7 th day after the start of class. The normal duration of the course for the fulfillment of the degree is two academic years. The maximum period within which a student is allowed to complete the course is four academic years. Internal evaluation is carried out by two internal assessments and assignment. Students should register themselves in the elective courses offered by the programs in that semester before the beginning of the class. For the open electives students of each program should apply to their respective program coordinator and he/she will precede it to the related program/department. Elective registration should be finalized by the program coordinator within first week from the beginning of the semester. Minimum number of students for each elective course should not be less than 6. Students should pass all the core courses before registering to the thesis but have to pass all the courses including elective courses before its defense. carried out by the Program supervisory committee. Note: It is the responsibility of the students to manage the resources for their thesis work. what is the exact time of class? I mean Is it a morning,evening or day? Look MSC Booklet 2072. Booklet 2073 is not published. I think It will be published next month i.e MAGH because MSC entrance is in FALGUN. what is the last date of form submission ? All MSc courses run in evening? no, some are in morning. i also dont know the detail information. Excuse me sir/miss, can i be provided with the first second and third merit list of civil for msc in year 2015??? I’m also looking for information on academic class hours. If there are classes in the day-time. I also dont know…if you know then inform me..
when is the msc entrance exam. please let me know. When will the entrance be for masters in civil engineering in IOE? ?